All hardwood is a living, natural fiber. In time, changes occur with hairlines in the grain and lightening. While these are normal outdoor hardwood characteristics attributed primarily to weather, you may want to maintain your furniture for a “like new” appearance. If left untreated, our stained finish on the Brazilian eucalyptus furniture will begin to fade and dry out. To maintain and protect the stained color and finish of your hardwood furniture, we recommend our Outdoor Interiors Refined Linseed Oil to be used at least 2 times in the spring/summer sunny seasons. All new furniture should be oiled prior to use. The number of applications vary depending on direct sunlight, temperature and dry climate versus more humid regions. Your furniture will provide tell-tale signs along the way, so “Please Oil” accordingly. Many items can be oiled in actual work time under 20 minutes with light cleaning first. Do not apply any furniture oil in direct sunlight. Apply oil generously and wipe away excess oil with a dry cloth approximately 1 hour after application. CAUTIONS: Using Linseed oil on natural unstained teak will create a much darker appearance initially before being placed in direct sunlight or outdoors for at least a 30 day period. Always test a small area under the furniture before finishing any piece or set with any oils, sealants or finishes. Caution: Always dispose of hardware oil soaked rags carefully and in a safe container due to fire concerns. If your Teak Furniture becomes soiled, use a mild detergent and a soft cloth only for cleaning. Do not use abrasive cleaners or cleaning products. Solid Teak should be oiled at least two times per year to maintain the golden teak color and to preserve hardwood integrity for many years. 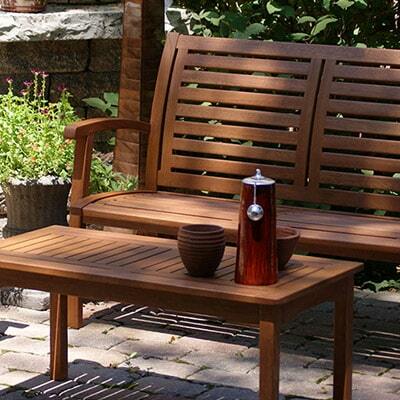 Use name brand teak or hardwood oils for outdoor use. Note that many Linseed Oils and other oils will darken natural teak. Always test a small inconspicuous to ensure compatibility and for color purposes. If Grey Patina is desired, there are preservatives available in the marketplace that will help you maintain this look and will help to protect and maintain this desired look. Furniture covers are always a smart investment when out of season and to help protect your furniture for many years of enjoyment. Hardwood oils will not harm wicker or sling material, however, it should be wiped immediately after any oiling projects. If wicker or sling becomes soiled or dirty, use water, soft cloths and brushes with mild detergents for cleaning. What is Refined Linseed Oil and are there other oils and types that can be used for maintaining outdoor hardwood patio furniture? You can use many different oils for conditioning and preserving your outdoor furniture. We recommend a refined linseed oil like what we manufacture in Vietnam with a premium danish based hardwood oil that we import and manage with our Vietnamese factory. It’s also great for indoor furniture. Boiled linseed is similar to refined and can be used but many of these off the shelf products available at hardware stores require more applications during summer months, and always use care in disposing oil soaked rags. Raw linseed in not recommended since many versions or brands require you to blend with mineral spirits and simply too messy and not good for many stained hardwoods. Tung Oil is a wonderful product for indoor furniture but not a good option for outdoor use primarily when in direct sunlight or dryer climates. Finally, many teak oils are good to use on outdoor patio furniture no matter what species of hardwood. Most linseed and teak oils will darken natural unstained teak. Always test hardwood oils prior to applications to determine if the color will change to your liking since many oils will darken hardwood especially natural untreated teak. See additional tips and instructions by visiting our Care & Maintenance section. Are the Outdoor Interiors solid teak and eucalyptus furniture items and sets made from FSC Certified Hardwoods? FSC® stands for Forest Stewardship Council® and it is the mark of responsible and sustainable products that are replanted and regrown in their region. All Outdoor Interiors hardwood products are FSC Certified. Where are the Outdoor Interiors’ solid hardwoods harvested from? All Outdoor Interiors FSC Certified Teak and Eucalyptus is responsibly harvested from a family plantation in Brazil and is grown with the utmost sustainability. Where is Outdoor Interiors’ furniture manufactured and fabricated? All our furniture and décor products are fabricated and packaged in Vietnam. Where does Outdoor Interiors ship from domestically? All furniture and décor product are shipped from Lake Barrington, Illinois. What is the woven wicker made from and is this all-weather for the outdoors? 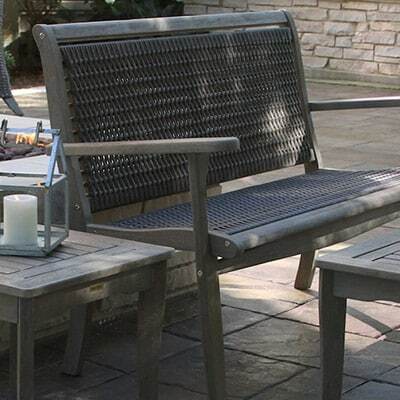 All Outdoor Interiors all-weather wicker is made from only (HDPE) High Density Polyethylene synthetic resin. Our wicker is all hand-woven around powder coated aluminum and solid hardwood frames. Our resin wicker will last 10 + years outdoors in normal climates and is guaranteed by Outdoor Interiors for 5 years under our limited warranty. Will Hardwood Oil (linseed) stain the All-Weather-Wicker during oiling? 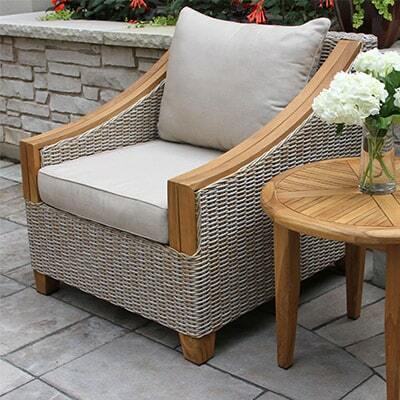 Our wicker is made from the finest quality (HDPE) High Density Polyethylene resin and will not absorb stains like hardwood oil, however when oiling you should wipe off excess oil so it will not leave a layer or film coating on the wicker. Use a soft cloth when wiping off excess. Does Outdoor Interiors furniture come fully assembled? Many items do come fully assembled or mostly assembled. You can find these items by using the filter button in the furniture categories or by flipping through our catalog. Is the Outdoor Interiors Eucalyptus furniture stained and oiled at the factory? All Brazilian Eucalyptus furniture from Outdoor Interiors is stained with a high quality brown umber UV stabilized finish and oiled prior to packaging from our factory. Brazilian Eucalyptus has a natural light red grain and is otherwise very light in color requiring a stain. Is additional stain available if damage occurs or for refinishing? Yes, additional factory stain is available for touch ups. For bigger projects, we also have a Sherwin Williams color stain match that can be provided for additional use and for matching other hardwood items. 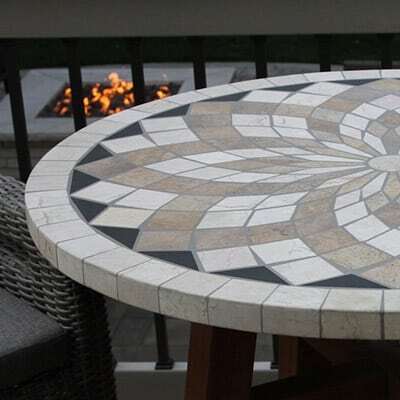 What is the warranty on Outdoor Interiors furniture and Décor products? There is a 3-Year Warranty on all Teak & Wicker Furniture and a 1-year warranty on the Eucalyptus, Stone and Décor Products in our product line. See our full Warranty on our website under the About Us Section. Are furniture covers available for various furniture sets and items? We only make covers for our 7pc Fold & Store Oval Sets that cover the folded chairs, table and cushions. This is a spun polyester weatherproof cover, but is not fully waterproof. This is because we do not like all Vinyl or waterproof covers for many hardwood items since they will trap moisture and create problems when heat intensifies when covered. Other covers are best available by searching by size per set. Our customer service team can further recommend the best covers like Duck or Protective Covers available at many retailers and online. What material is used on the sling chairs, loungers and ottomans? The sling material is a woven resin plastic fiber that is UV stabilized and lasts up to 10 years if cared for properly. It is a fully weather resistant product that resists stains, oil and dirt. We warranty our sling for 3 years. What is the difference between dining height, counter height and bar height? Dining height is at 29-30”. All of our dining arm chairs fit under our tables with varying seat heights from 18-20”. Counter height stools range from 22-26” height from the floor to the top of the stools, and are ideal for meeting counters or counter height tables that are at 34-36” in height. A bar stool seat is about 29-30” from the ground and is perfect for counters or bar tables that are 38- 40” in height. What type of hardware is included with all furniture items and sets? The hardware (screws, bolts and washers) for Outdoor Interiors Teak furniture is all stainless steel. The hardware for Brazilian Eucalyptus furniture is made from galvanized zinc. What is the weight limit on Outdoor Interiors chairs and loungers? The weight capacity for all chairs, stools, chaise loungers, Adirondacks & swing loungers is 250 lbs. Benches have a weight capacity of 350lbs. 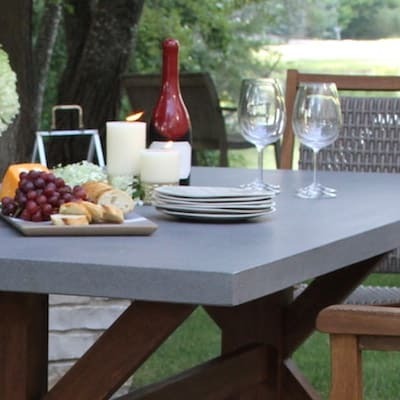 Do Outdoor Interiors’ Tables include umbrella holes? All Outdoor Interiors Dining Tables include a 2” standard umbrella hole to use upwards of an 11’ Umbrella. We recommend a 9’ umbrella for most sets. We do not recommend the use of 11’ Dia umbrellas for less than 48” diameter tables. 11’ Umbrellas are ideal with our 64” Grande Tables and large Rectangle Dining Tables. Only 1 bar table, #65432, includes an umbrella hole. No other counter height, bar height or bistro tables include umbrella holes. What kind of oil or torch fuel is used for Outdoor Interiors decorative oil torches? We recommend using Tiki torch or Lamplight branded outdoor citronella or lamp oils in all outdoor torches. Do NOT use kerosene oil or any other combustible oil. Outdoor Interiors DecoraFlames torches are for outdoor use only. Please see our Video for further tips and cautions. Stone sealant should be applied once a year to protect the grout and natural stone from the elements. If stone and grout becomes soiled, use a mild detergent with water and a soft cloth / soft brush for cleaning only. Do not use abrasive cleaning products. Avoid cleaners containing ammonia, bleach, abrasives, or other hazardous/polluting compounds. Always test in small inconspicuous area while using a new cleaner to ensure compatibility. We take for granted the care & reasonable use of outdoor fabrics (regardless of type; spun polyester, olefin or sunbrella branded materials). While outdoor fabrics are intended to be used outside, they still require reasonable care and storage when not in use. If most fabrics become soiled, then use a mild detergent and a soft cleaning brush and/or cloth. Refer to the sewn in tag on each pillow or cushion for additional instructions. We also recommend using 303 Fabric Protectants for their sun blocking technology keeping all outdoor fabrics looking like new and lasting longer. To clean and/or revive the appearance of your torch, polish gently with a soft dry cloth. The wick should extend no more than 1/4 inch and you should allow five minutes for the wick to soak in the oil before lighting. Please watch our instructional Video for additional care, use and cautions.